According to a recent study, almost 29 million Americans suffer from headache. Deadlines, stress, traffic jams, sinus, migraine, food allergy, hangover, lifestyle, food habits and hundreds of other reasons can trigger a headache. To deal and manage, we often depend on antibiotics. But think once, is it really healthy to depend on medicines for such a common thing is our regular life? Can Apple Cider Vinegar Really Cure Headache…? Apple cider vinegar doesn’t heal the way as an over the counter medicine does. As you know, apple cider vinegar is a solution for many health ailments similarly it fixes the root cause behind the trigger. For example, if your body triggered a headache due to dehydration, when you consume apple cider vinegar with water, it provides enough minerals to body to cope up with the problem. Hence, you will get relief from the pain. ACV is a healthier alternative for over the counter medicines. You can find many testimonials online claiming how apple cider vinegar helped to get relieve from a headache. 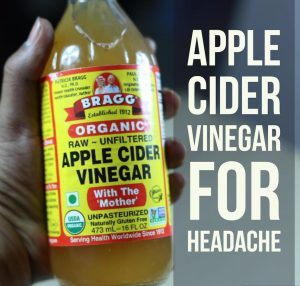 How to Use Apple Cider Vinegar for Headache? This method is efficient for a sinus headache. Combine 1/4 cup of apple cider vinegar and 3 cups of water. Remove from the flame, place a towel over your head and inhale the vapors. Continue to inhale for 5 minutes. Repeat whenever you have a headache. This remedy works for almost all types of headache that include menstrual migraine, stress, sinus headache and migraine. Mix 1 tablespoon each of apple cider vinegar and honey in a glass of water. Alternatively, you can use lukewarm water. For added benefits, add the juice of half lemon. If you are experiencing headache daily, then try this method. Mix 1 tablespoon of apple cider vinegar and 1/2 teaspoon vitamin C in a cup of water. Repeat daily for 1 week to observe any results. Follow the method again after 3 weeks gap. This method helps to draw the blood down to the feet, cleanse the blood and cool it. This process is effective for migraines and stress headache. Mix 1 tablespoon apple cider vinegar and 1 teaspoon peppermint oil in a large bowl of water. Soak your feet for 20 minutes. Repeat whenever you experience a headache. This method is effective for a stress headache. Soak a clean cloth in apple cider vinegar. Wring out excess and refrigerate for few minutes. Rest the washcloth on the forehead until it gets warm. You can also take apple cider vinegar in tablet form. Take 1 tablet whenever you are experiencing a severe headache. Avoid apple cider vinegar if you have diabetes, as the chromium present in it can affect insulin levels. Pregnant and nursing women should consult a doctor before using it. Constantly drinking apple cider vinegar for a longer period of time can cause slight damage to skin membranes of the digestive tract. Apple cider vinegar can damage tooth enamel so it is better to drink it using a straw. Don’t consume apple cider vinegar without diluting. Consuming more apple cider vinegar can cause diarrhea. Take a nap whenever you experience a headache. Massage your forehead using lukewarm coconut oil or almond oil. Keep an eye on what you eat or drink as certain foods can also trigger a headache. To minimize stress do meditation. I hope this article was helpful to you. Write us your queries and feedback in the comments section below.